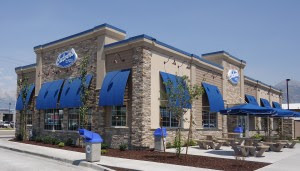 Culver's is to be built at 946 Pancheri Drive. I had a request to find out what’s going on in the Wal-Mart parking lot on Utah Avenue. A review of building permits in the city of Idaho Falls eTRAKIT system (which I have to admit I’m still getting the hang of) show that this is a Wal-Mart fueling station. The actual address is 510 S. Utah Avenue. The permit was applied for June 22, the site plan was approved Sept. 6 and the building permit was issued Oct. 24. The total share footage of the project is 966,659. Also down that way, Culver’s is coming along. The address will be 946 Pancheri Drive. The restaurant is 4,457 square feet. The permit was applied for Aug. 22. If you want to look at it, here’s a link: Culver's Permit. Pretty neat, huh? I love Culver's, but I can't envision where the restaurant will fit in that space.